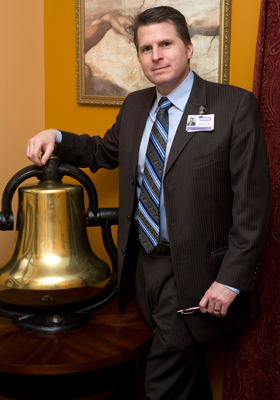 Dr. Douglas Iddings stands beside the “cancer victory bell” that is located in his office. Every time the bell is rung, it signifies that a patient has beaten cancer by either entering into complete remission or by being cured of the disease. GRAND BLANC — With technology in the medical field evolving more each day, one local surgeon was able to utilize it to make history in Michigan. Surgical Oncologist Dr. Douglas Iddings, a Davison resident, recently performed a very cutting-edge surgery in November known as Whipple’s procedure at McLaren Regional Medical Center. The Whipple’s procedure is a minimally invasive surgery used to remove pancreatic cancer and reconstruct the digestive system with the help of robots. “What we have done is the first in Michigan and there is probably only 50 done in the whole country,” Iddings said of the Whipple’s procedure. Iddings, who has spent the last decade in advanced surgical training, said for years the procedure has been a hot topic on the surgical front and widely discussed at meetings and conferences. Prior to the minimally invasive technique, Iddings said the treatment for pancreatic cancer had been well established as a classic open surgery where a large incision of at least 12 inches would need to me made. With the evolution of robotic equipment however, minimally invasive techniques began growing beyond just being applied to simple surgeries. Iddings said the benefits of minimally invasive surgeries, which include smaller incisions, less blood loss, less pain and a quicker recovery period, have been proven in prior surgeries and were proven in the Whipple’s procedure he performed in November. Had it not been for the advancements in technology though, Iddings said his patient’s outcome could have been much different. Although Iddings said he feels the medical field is heading in the right direction and making progress in regards to minimally invasive surgeries and using robots, he said it is still “ultra challenging” to perform these types of procedures with the equipment currently available. In the years to come however as the companies responsible for building the robots constantly are improving their equipment and software programs, Iddings said the surgical field will shift to accommodate those changes. For more information contact Iddings’ Grand Blanc office, located at 8384 Holly Rd., Ste. 1, at 810-733-8400 or go to his website at www.driddings.com.